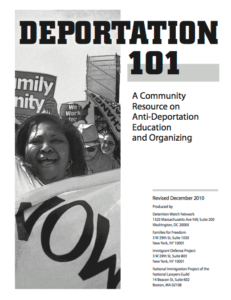 Deportation 101 is a training tool that educates and builds the capacity of immigrant and criminal justice service providers, immigrant leaders, and community organizers to respond to their members’ and clients’ needs as they interact with the criminal justice system. It functions as a free, 1-2 day-long seminar on the criminal-immigration system, accompanied by a manual developed jointly in 2005 by IDP and Families for Freedom. Detention Watch Network and National Immigration Project, who contributed to an expansion of Deportation 101 in 2007, now also serve as important partners in developing and presenting these trainings. an overview of tactics and strategies to use in building case campaigns and responding to abuse in detention. how campaigns across the country are challenging these programs. We have used Deportation 101 to train more than 1,000 people around the country, including in New York, New Jersey, Massachusetts, Florida, Washington DC, Texas, and Illinois. The manual is available here in English and Spanish.